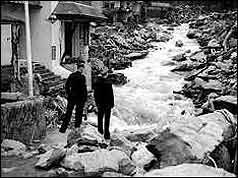 In August 1952, the village of Lynmouth in Devon, Britain was struck by one of the worst floods the country has ever seen. Thirty-five people lost their lives when 90 million tons of water and thousands of tons of rocks battered the town. At the time, the disaster was classified as "the hand of God," and locals were left to clean up the very messy aftermath. However, in the early 2000s - nearly 50 years after the devastating flood - intel emerged that suggests the disaster may have occurred at the hands of scientists rather than the hand of God. Declassified documents allege that the Royal Air Force staged cloud-seeding experiments in the Lynmouth area between 1949 and 1955, resulting in torrents of rain - and in 1952, 35 deaths. Although the RAF originally denied conducting any such weather-controlling experiments prior to 1954, Alan Yates, a senior lecturer at Cranfield College of Aeronautics and a glider pilot, claims the scientists asked him to assist them in a cloud-seeding project named Operation Cumulus. According to Yates, the project was successful in producing artificial rain, creating heavy downpours some 50 miles away from Devon. On the night of August 15, 1952, nine inches of rain fell in Lynmouth, swelling two rivers until they broke their banks and flooded the village. And the rest, as they say, is history. Or is it? While the Ministry of Defence claims there is no evidence that RAF scientists were responsible for initiating the Lynmouth floods, this is not the first time that "weather control" conspiracies have been theorized over. Governments have been implementing cloud-seeding for decades since the artificial rain-making method was discovered in 1946, and conspiracy theories about weather control have abounded for nearly as long. Although manipulating the weather sounds like a science fiction experiment, the declassified documents about Lynmouth's 1952 disaster suggest that weather manipulation is more science than fiction, and steadily continues to become a reality. As recently as May 2018, Forbes reported that China was launching a weather control initiative that would cover a land mass the size of Alaska. With technological advances progressing on practically a daily basis, how far-fetched is it to believe that governments and other higher powers may have the ability, after more than 50 years of supposed experimentation, to alter weather? With recent meteorological disasters like Hurricanes Harvey, Irma, and Maria laying waste to multiple countries in quick succession, at what point do we question whether such events are the results of the hand of God, or of the hands of government scientists playing God? Read about the Lynmouth flood disaster and RAF rainmaking experiment HERE.